Easy-peasy cannoli dip recipe that is absolutely delicious! 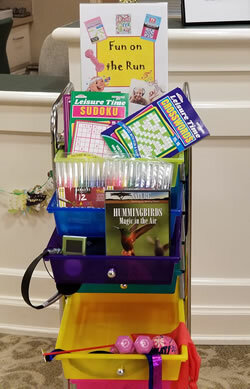 Word search, crosswords, adult coloring books and markers, 1 lb weights, stretchy bands. Also will incorporate my Music & Memory Program with MP3 players loaded with different genres of music, ie. big band, classical, opera, etc. 1. Do you stay in the room and work with a resident? 2. Do you drop off items and if so do they keep them or do you wait a few days to get them back? Do you sign out items? Thanks so much for your input and comments/suggestions! Yup! At New Jersey gas stations, they must pump your gas. One of the reasons is so you don't top off and cause a spillage (which I saw last week while the lady in front of me wasn't paying attention and the gas came squirting out!). 1) I have an overhead projector and copy crossword puzzles onto the transparencies. I call out each clue, how many letters etc. so that our visually impaired residents can participate, too. I've noticed that this also sparks conversation with those sighted folks who help with clues! 2) Purchase painting canvasses and use masking tape to create blocks/squares, triangles. Set up three paint colors for each person, telling them the location of each color, then have them 'feel' the tape and paint within those lines. (They might want to wear gloves). It dries in less than 10 minutes. Gently peel off the tape and voila! You have a masterpiece. We purchased a set of indoor Bocce balls from Walmart. They're heavier beanbags and they don't roll very straight which makes for a challenging and funny game at times! I'm new to this site and love it! I just submitted an easy-peasy cannoli dip recipe that is absolutely delicious! You can use sugar cones or cannoli shells (I break them into pieces) to scoop up this delicious dip! Mangia!